After the queue for fuel we have some welding to get done. Our shock absorber problems persist and we now need to weld where the top of the shock protrudes through the mounting point. 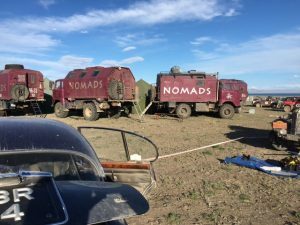 A Nomad is under the car and welding pretty quickly – he saves time by the fact that he wears no eye protection or face mask, but he is well out of the reach of Health and Safety. 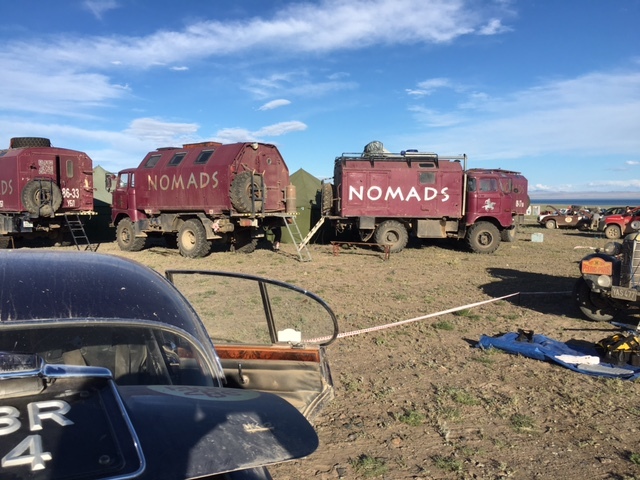 The Nomad trucks are fascinating, mainly because after 10 hours in a low slung Jag the idea of driving one of those trucks looks fun. Looks can be deceiving as I am told they drive like pigs and the kick back on the controls could break your wrist. Helg, the German, Mongolian speaking, self professed hippy Nomad and our go-between for the welders and the rented tents happily and efficiently collects the USD and jobs get done pretty quickly.